These last few days have been a little short on free furniture for architecture. You can imagine that from the lack os posts about furniture here at Blender 3D Architect. 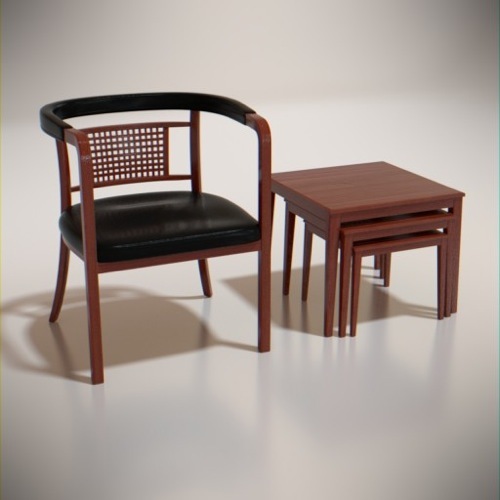 Besides hunting for quality projects using Blender for Architecture, I'm always trying to find nice furniture models for our readers(you) and students. I just found a lovely wooden furniture collection made of a chair and some side tables. The models were all created by, and artist called nhumrod, and all models have a creative commons zero licenses. With this license, you can do whatever you want with the files. There is no need to mention the author on your projects. It is a simple collection but all models have Cycles materials, and even the studio setup for the render preview seems interesting. Just like I keep mentioning to my students, it is never too much to have options on our furniture library. And since this set has all we need for architecture, it won't hurt to download. If you follow the link to the profile of the author, you might find some other useful free furniture for architecture in Blender. For instance, an LED TV model and some plastic window frames. All the models with the same creative commons zero license. Keep in mind that BlendSwap is an incredible resource to find free furniture for architecture, but you should also create your own. At some point, you will need a model, and won't find it anywhere. The solution will require some modeling work in Blender. Whenever I find some free furniture for architecture, I will keep sharing it in Blender 3D Architect. You can also start modeling yourself for architecture using our online course about architectural modeling with Blender. The course doesn't focus on furniture but can work as a starting point. The course deals with the most important topics for architectural modeling. An example is precision modeling and the use of snaps for transformation. Just visit the course page to see all lessons available. And don't forget, all students from Blender 3D Architect receive free content upgrades.